available from a variety of service equipment manufacturers. SSAS offers an extremely low lifetime cost. Service Card in this edition. Xantic 68 wide range of communications services providing a SSAS solution. Efficient communication is critical to a successful business enterprise, especially for companies working at sea. Operating seamlessly at speeds up to 2 Megabits per second. Sealink service from Marlink is "always-on" and "always available' at a fixed price ensuring increased operating and cost efficiencies. Whether your operations are located on a cruise ship in the Caribbean, a container ship with a global schedule or on an oil platform in the North Sea. 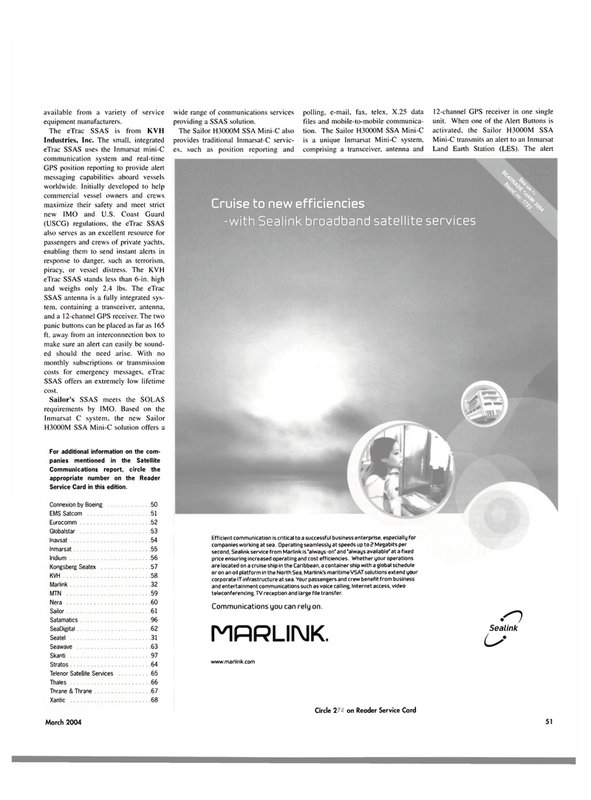 Marlink's maritime VSAT solutions extend your corporate ITinfrastructure at sea Your passengers and crew benefit from business and entertainment communications such as voice calling. Internet access, video teleconferencing. TV reception and large file transfer. Communications you can rely on.